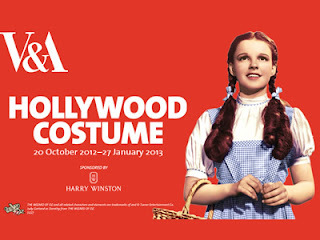 Last Friday Charlotte, Myrtle, Dad and I went to the Victoria and Albert Museum in London's glitzy South Kensington to see the Hollywood Costume Exhibition. Judy Garland's Dorothy Gale gingham dress from The Wizard Of Oz was there, along with Marilyn Monroe’s white dress from The Seven Year Itch and all manner of costumes from The Matrix to The Birds, from Indiana Jones to Fight Club. Each had an explanation by the designer of what they were trying to achieve. It was quite interesting to read about the process of costume design - how it helps tell the story. And indeed how much input a director will have - often doing drawings for the costumes designers to use as a guide. There was an example of Steven Spielberg's sketch of how Indiana Jones should look and that was almost exactly how he turned out. It was the little touches that stood out - the narrowed rim to the hat so the camera could always see Harrison Ford's eyes; the boots were of a comfortable style due to the long hours expected on set. The show generally was very well put together and there was much of interest to see in the three large rooms - but the crowds were simply horrendous. A common complaint of these headline shows I'm afraid. Worth a look though. When can I see these celebrities wearing like what Nicole Scherzinger wore at the launch of the 4G network in London. :D That would be terrific!